Lanting houses. Photo from architectureintlprogram.files.wordpress.com. Did you know, there are still many areas in Borneo, which are swamp. Like in the Netherlands, some areas in Borneo are below the sea level. About 20 centimeters under sea level, to be more precisely. No wonder, people there are so familiar with the boat, river and… rumah lanting (lanting house). 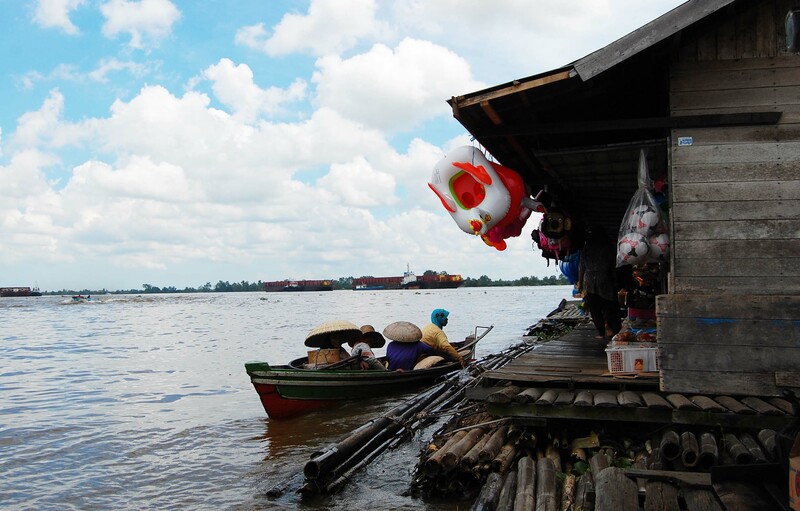 Walk along the Barito River from Banjarmasin to Puruk Cahu, you’ll find villages inhabited by Dayak Bakumpai Tribe. Typical scenery there would be floating houses lining the banks of the river. We call it lanting house. The traditional house in South and Central Borneo. Some people might say it’s fun to dwell in that kind of house. But some others will get seasick. Every time a boat pass nearby, the residents of lanting house will oscillate by the wave. It occurs quite often, including at night. It’s because lanting houses are built down on the major rivers, which means they are located on the main lanes of Bornean traffic. It’s also influenced by the ups and downs of Java Sea. However, lanting house certainly is good to anticipate the flood. 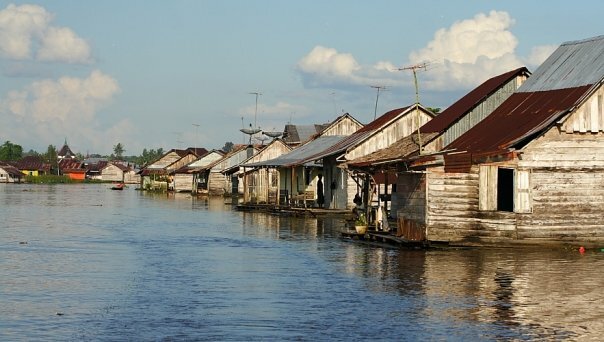 When normal houses are submerged by three meters of flood, lanting houses are floating tall there, like Noah’s ark. Lanting house usually faces the land. It has two rooms, a living room and a bedroom. Each has about 5 x 3 meters square. The bedroom is a private space that can only be accessed by members of the family. While the living room is a public space for social activities. The living room is also sometimes used for cooking. Woods. For the foundation and framework of the house, we need the wood that is not easily decayed in water for at least 10 years. Meranti and bangkirai, for example. We are going to use them in logs, with a diameter of 50-100 cm and a length of at least five metres. Meanwhile, to make the roof, we need durable wood to protect the inhabitants from rain and blazing sun. We usually use sirap, wood that has been cut with a thickness of 3-5 cm. Sago palm leaves. In addition to using sirap, the roof of lanting house sometimes also use sago palm leaves. They are easily to compose, yet watertight. Sago palm leaves are also lightweight, make the foundation doesn’t work too hard to support the house and the content. Iron sheets. As the roof, iron sheet is almost same light with sago palm leaves, but it’s more practical to install. Ropes. Its functions are to connect the parts of the house and to tether, so the house doesn’t go anywhere. Why the house mustn’t go anywhere, by the way? How do Bornean people build rumah lanting? Prepare some wooden poles. Implant them in the middle of the river. Line the logs up on river banks. How many logs? It depends on how large is your lanting house would be. On top of the wood, put the wooden boards as the floor. Done with this, you have a big raft now. Push the raft towards the poles in the middle of river. Don’t forget to fasten it to some strong poles on the land to make sure it’s always there. Install walls and some partitions, and nail them. Done! It’s ready for occupancy. A lanting store. Photo from kapoelaga.wordpress.com. By the way, lanting house isn’t just a place to live. There are also other functions like lanting for bathroom, jamban (toilet with a hole directly into the river), laundries, mosques, hotels, karaoke places, stores, schools, food stalls, gas station, markets, and many more. Mention any basic need in civilization, we would find a lanting serve for it. Well, if you remember Kevin Costner’s movie, Waterworld (1995), some places in South and Central Borneo are pretty like that. No matter how exotic living on the water world, human is a land creature. They tend to live on land. The condition on the ground itself is relatively stable. Land houses are more practical to build and to maintain, compare to lanting houses. One of the hassles of dwelling lanting is to respond to the tidal river. When the river is receding, we have to push it to the middle of river, so the house doesn’t straddle on river banks, which causes the floor tilted. When the water level has increased, we have to make sure the rope tethers strongly, so it doesn’t sail away. Not to mention that it’s getting harder to get woods as material for building lanting house, and difficulty of life outside of the fishing profession. In addition, the the Local Government is organizing the areas, including some lanting complex that used to be unorganized and slummy. Lanting houses are getting difficult to find. I think, it’s not impossible that someday this traditional house will only exist in the history books and articles like this. Or, the contrary, lanting could be a prototype of the future houses. Considering the global warming effect: the sea level tends to raise, and we all are about to sink.